When it comes to extreme longevity, women are the stars. Men who reach super-centenarian status are rare specimens. 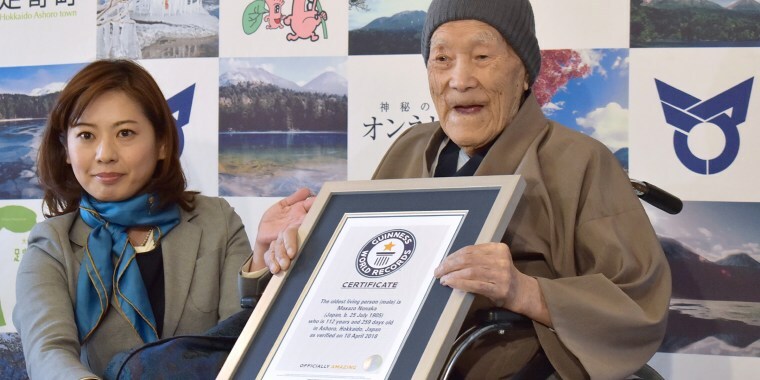 Meet one of them: 112-year-old Masazo Nonaka, who was confirmed as the oldest living man by Guinness World Records on Tuesday. Nonaka, who lives in Ashoro, Japan, was born on July 25, 1905 — the same year Albert Einstein introduced his theory of special relativity and President Theodore Roosevelt was inaugurated for the second time. Nonaka credits his longevity to soaking in hot springs and eating sweets, responding "yum" when he was presented with a cake that accompanied his official record certificate this week. He’s especially fond of strawberry sponge cake, but any dessert will do, his family said. Nonaka — who lives with his family and likes to soak in the hot springs that surround the bed and breakfast they manage on the island of Hokkaido — avoids stress by being clear about his needs: If he doesn't want something, he makes sure everyone knows about it, his daughter told Guinness World Records. He also likes to watch sumo wrestling on TV. He takes over the record from Francisco Nuñez Olivera of Spain, who died in January at the age of 113. At any one time, there are only about 300 super-centenarians — people who are 110 and older — living worldwide, Dr. Thomas Perls, director of the New England Centenarian Study and professor at the Boston University School of Medicine, told TODAY. Nonaka is currently the only man on the list of validated living super-centenarians maintained by the Gerontology Research Group. The oldest person currently on the list is 117-year-old Nabi Tajima, a woman in Japan. The all-time record for the oldest person ever is held by Jeanne Louise Calment from France, who lived 122 years and 164 days until her death in 1997. People who live extremely long lives aren't born with just one “aging well” gene, but many of them — “it’s like winning the lottery,” Perls noted — which allows them to delay or escape major diseases. Women are much more likely to enjoy extreme longevity: About 85 percent of centenarians are women. At the most extreme ages, 110 and older, that number grows to 90 percent, Perls said. There is no clear explanation for why women live longer.